I’d like to talk with you about eating habits. The habits you have around eating are strong predictors of your health, your weight and your longevity. 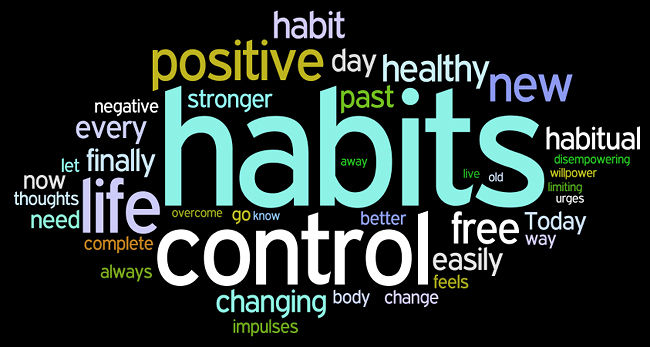 It’s one of the features in my 6 Weeks to Diet Freedom because I think habits are a very important topic. Skipping breakfast. If you are in the habit of skipping breakfast, you are depriving yourself of energy for your mind and body. Reasons may be not making time for it, or eating late the night before, or rationalizing that if you skip breakfast you are cutting back on calories. Skipping lunch. Another habit you may have is skipping lunch and staying at your desk to get more work done. A study in the Harvard Business Review shows that skipping lunch and not taking a break from work at midday actually lowers overall productivity. Grazing. Are you someone who keeps crackers or cookies or energy bars in your desk drawer? Grazers may not feel terribly hungry at mealtime because of all the snacking which in the end deprives you of the nutrients like vegetables and protein you would get from an actual meal. It also keeps your blood sugar levels higher than needed in between meals. Night eaters. If you are a night eater, you may not be hungry for breakfast. You may be more prone to acid reflux. You will not have time to burn off the food you eat and that can make it harder to maintain a healthy weight. If your eating habit is one of the four I’ve listed, you might want to change it up in 2019. Each of these habits deprives you of a very important part of eating - the experience of sitting down for a meal. It’s only when you sit down, separate from work or other distractions, that you can truly experience all the pleasures of food: taste, texture, color, aroma, and satiety. Eating in distracted ways - skipping meals, grazing and night eating - deprives you of knowing how much you need and turns the eating experience into something mechanical. When you return to the habit of conscious connection with food, much like that of a baby having their first solid foods, you will benefit your mind and body, and waistline, in ways I’ll describe in the solution below. We got into trouble with weight gain in the 80’s. I believe some drastic changes in eating habits caused this upward tick in weight. They include: replacement of fat with sugar in many packaged products; larger plates and therefore larger servings; grazing; frequent restaurant and take-out eating, moving away from eating at the table; and moving away from our basic three meals a day habit. What I recommend is a return to the table 3 times daily for real meals made of nourishing foods that keep you satisfied until it’s time for your next meal. Doing this can regulate your hormones and return you to the pleasures of eating quality food. Have you forgotten how to cook, or never learned? Eating simple whole foods is easy once you get into the HABIT. Visit my Programs Page to see the many ways I can work with you to make the three meals a day habit a steady part of your lifestyle. Or for a simple start, order a copy of my book Food Becomes You - Simple Steps for Lifelong Wellness and start a lifetime habit of healthy eating and weight management. Newer PostIs Nutrition Coaching Only for Weight Loss?